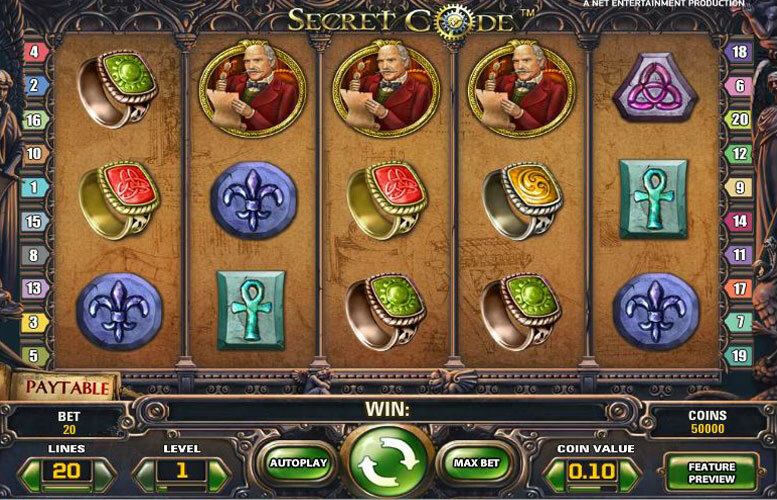 With a 96.3% return to player percentage and a 400,000 coin top jackpot prize the Secret Code slot machine is one of NetEnts better options. Couple that with the bonus feature, where you must open chests with the secret key to reveal prizes, and you’ve got yourself a slot machine well worth taking for a spin! There are a lot of cult references in this game and it is a little creepy but it’s certainly unique and worth a spin as chances are you won’t have played anything quite like it before. There are a lot of different wild symbols that can open you up into free spins and bonus rounds, which makes it easy to start winning big and the max jackpot is 400,000 coins which is impressive. This is won using the gamble feature after the bonus round but more on that below. 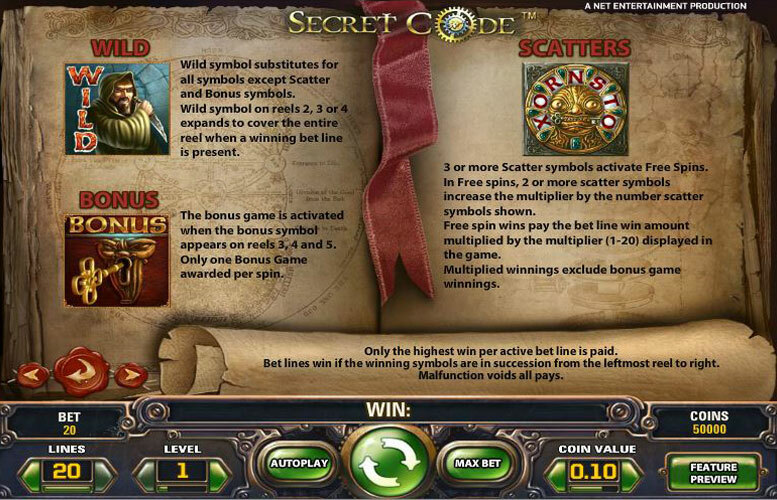 Secret Code is definitely one of the more simple and easy to understand slots and any game that allows you to sit down and start playing without needing to read the instructions is always a plus. 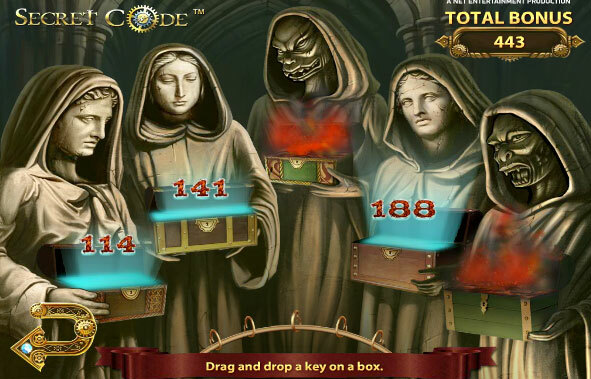 You can also match the Key symbol to enter into the Secret Code bonus feature. You will be transported to a room with a group of people wearing masks. Here you must drag and drop a key onto the different boxes to open them. These will reveal if they are angels or demons. Angels will award you with a prize, demons will not. Once all the keys have been used you will return to regular play. At the end of this game you can enter into a gamble feature. You will be able to bet all or half of your winnings. You will then be given a key, which you will need to match with one of the boxes on the screen. If you match the correct box you will double up your win with the max win being 400,000 coins. This feature cannot be accessed when you are on auto play. You match up the Escutcheon Rim in order to enter the free spin bonus round. Here you can add additional spins and multipliers while you are in this game to earn higher prizes. The multiplier can go as high as 20x to help you win the max amount possible. Illuminati Member – This is the wild for this game. It only appears on reels 2, 3 or 4, but will expand to help you win more when it is activated. You cannot use this to replace the Escutcheon Rim or the Key bonus symbol. Key Bonus – This is one of the scatter symbols for this game. This will also trigger the Secret Code Bonus Feature when it appears on reels 3, 4 and 5 at the same time. Escutcheon Rim – The rim acts as the second scatter for the game. Matching up three or more of these allows you to enter the free spin bonus round. Symbologist – This icon will pay out 10 coins for every match of two, 50 for a match of three, 200 for a match of four and 4000 for a match of five. Treasure Hunter – This symbol will pay out 7 coins for a match of two, 40 for a match of three, 150 for a match of four and 2000 for a match of five. 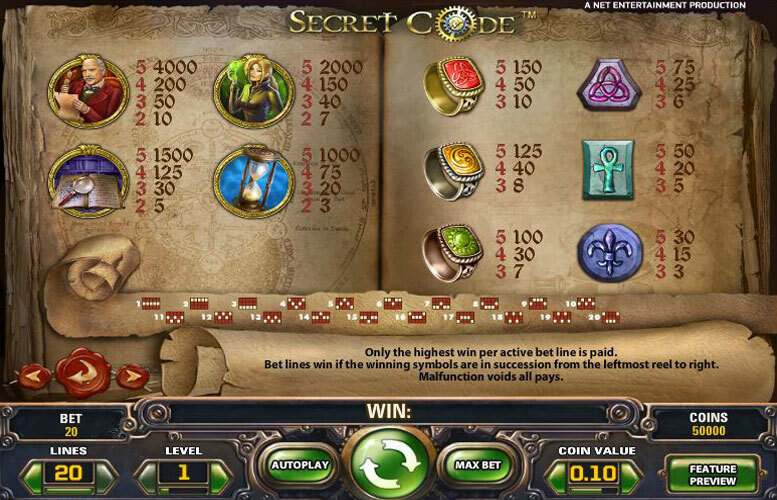 Book of Secrets – The book pays out 5 coins for a match of two, 30 for a match of three, 125 for a match of four and 1500 for a match of five. Hourglass – An hourglass will pay 3 coins for a match of two, 20 for a match of three, 75 for a match of four and 1000 for a match of five. Celtic Ring – The ring will pay 10 coins for a match of three, 50 for four and 150 for five. Ying Yang Ring – This pays 8 coins for a match of three, 40 for four and 125 for five. Sun Ring – These pay 7 for a match of three, 30 for four and 100 for five. Celtic Triquetra – This pays 6 for three, 25 for four and 75 for five. Cross – This pays 5 for three, 20 for four and 50 for five. Fleur de Lis – This pays 3 for three, 15 for four and 30 for five. Players are allowed to bet between 0.01 and 0.50 coins per pay line. You can bet a maximum of five coins on each of the 20 pay lines that are available. Only one winning combination can be activated per pay line but you can win on multiple paylines for every pull, which makes it easier to win. The min bet per spin is 0.01p and the max is £50 in UK money so there’s plenty of scope for all players. Many of the bonus features are based on chance so higher bets will not necessarily help you win these prizes, though they will increase the value of the prizes you win.